Update: West Games founder Eugene Kim said that the developer was unable to provide an update on Kickstarter or notify backers at the moment. It’s not clear why. An official statement will be go up in the next couple of hours, however. 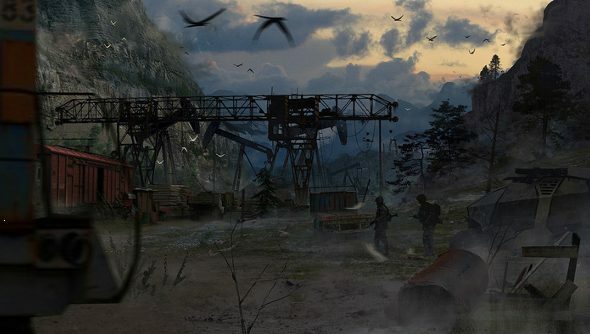 Post apocalyptic shooter and so-called STALKER successor Areal has had a dramatic Kickstarter; one filled with accusations, spam-filled comment sections and a lot of strange characters cropping up. It’s almost become fantastical. And today, only a few days after the Kickstarter campaign exceeded its goal – a surprise to everyone – the campaign has been suspended. The attention Areal garnered should have come from its supposed legacy, being apparently created by ex-STALKER developers. But that’s not what put it on radars. The campaign hit a bump in the road when Vostok, also made up from STALKER devs, claimed that Areal creators West Games were not being honest about its relationship to the series. West Games continues to maintain otherwise, and even brought on STALKER’s lead designer as producer. That was not the end of the drama. The Kickstarter page has been plagued by spam, trolling and serious accusations. West Games claims that the studio is under attack from Russian trolls, as it’s a Ukrainian developer. It seemed like not a day could go by without more issues arising. And all of this negative attention did nothing for the campaign. Backers were dropping like flies, and Kicktraq showed that very little money was being pledged each day. Then a suspicious letter from Vladimir Putin appeared endorsing the game. Fake or otherwise, it’s a bit bonkers. It looked like the Kickstarter would fail, but on the weekend, over $20,000 was pledged. Because of backers pulling out, it’s not quite clear from Kicktraq how many new backers pushed the project past its target. So despite everything, the campaign seemed like it would be a success. Until today, when it was suspended right at the finish line. West Games hasn’t made a statement in regards to this suspension. The last updates are all from yesterday, attacking VG24/7 and Forbes, apologising for said attack and then thanking Vice for covering the game. We’ve reached out to West Games, and will let you know when we find out more.